This is also a standard step for my games - I upgrade anything new to match their counterparts from the previous level. In the case of BH6, you'll want to bring the Archer Tower to level 5 and the mines/MegaMine to level 5 as well. Get the Crusher up to level 4 (level 5 is where it gets expensive). I'd make this the last of the new items to upgrade to match existing, though. The Roaster can wait a little bit. 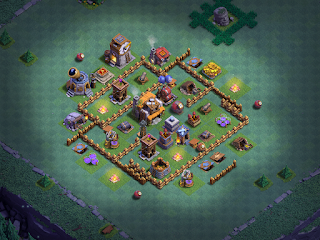 One of your new BH priorities should also be getting the Star Laboratory upgraded as soon as you have enough elixir saved up to do so. Ideally, this will be just a day or two after you've upgraded. This is important because you want to be working on troops as soon as possible. The game meta strongly favors air at BH6 (BH5 too, for that matter) so I start there on the upgrade path. First, get the FireCrackers to level 6 followed by the AirBombs. Once they are done, move on to the first three levels of the Roaster, then split back off to your Archer Towers. In between, hit things like mines and traps. Since the level 6 upgrades take a few days to build up resources for, and mines and traps are cheap, I like hitting them along the way. Next up, get the Hidden Tesla to level 6 followed by the remaining three levels of the Roaster, then Cannons, the Crushers, and the MultiMortar. I usually leave the Guard Post to the absolute end; you don't get a whole lot for upgrading it, although I guess taking the troops to level 12 is worth it on the long. Assuming your Battle Machine is at least level 5, I suggest putting that off to the very end as well. There are far, far better places to put your elixir and the BM uses up 8.5M; even at max loot, that will take a few weeks to knock out. A better use is troop upgrades. Once all these are done, THEN I would hit the Clock Tower, Gem Mine, and maybe walls if BH7 hasn't been released yet. When is the best time to upgrade the Battle Machine...? This depends on your personal preferences. Myself, I say keep pouring that elixir into your troop upgrades until everything but Cannon Carts are at level 12. If you're rushing, or BH7 is released - I'd probably put it right after Night Witches. Either way, I'd definitely do Night Witches before the Battle Machine as they open up a lot of attack strategies.